The Lyrids return. Image Source: Behind Astrography. 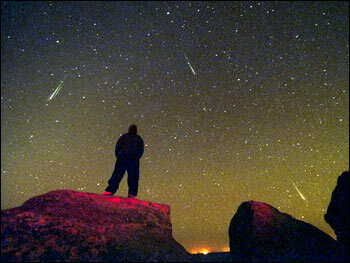 Tonight and especially tomorrow night (the night of 21-22 April) mark the peak of the Lyrids meteor shower. 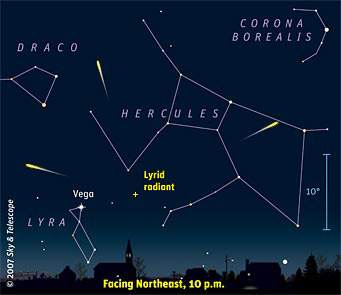 The meteors are visible from April 16 to 26, with their radiant in the constellation of Lyra, easy to view because the star Vega is located in it. Vega is the fifth brightest star in the whole night sky and the second brightest star in the Northern Hemisphere. As a relatively close star, Vega has long been studied and is widely considered by astronomers to be the most important star in the sky after the Sun. Wiki comments that the "source of the meteor shower is the periodic Comet C/1861 G1 Thatcher." The shower was first recorded almost 700 years before the birth of Christ by a Chinese astronomer, and was noted in one of the earliest works of Chinese history, the Zuo Zhuan, which states: "On day xīn-mǎo of month 4 in the summer (of year 7 of King Zhuang of Lu), at night, fixed stars are invisible, at midnight, stars dropped down like rain. (夏四月辛卯 夜 恆星不見 夜中 星隕如雨)"
The best-viewing time listed in this pictorial is for the UK in 2011. Image Source: behindastrography. While this is not a storm noted for many meteors at its peak, this is the first annual shower in 15 months where the moon has not been blocking the view. The Lyrids are also known to have sudden bursts of meteors. To see them, look at this chart for viewing directions worldwide. In the Northeastern United States, Ontario, and Quebec, look Northeast from 11:30 p.m. and then East up to 4:30 a.m. EST. In the UK, look at the skies earlier in the evening. Viewing later in the evening: look East. Image Source: Astronomy via Blogster. 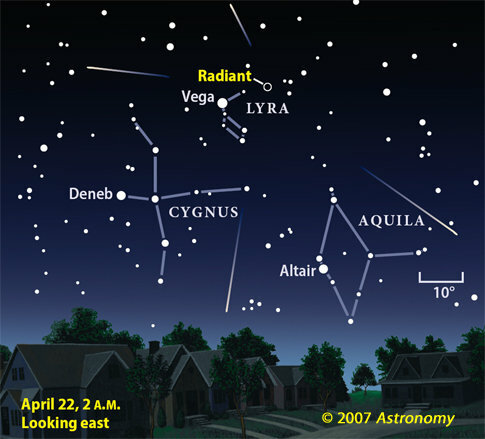 The constellation of Lyra is the shower's radiant, between Hercules and Cygnus the Swan. Image Source: Living Moon Astrology.